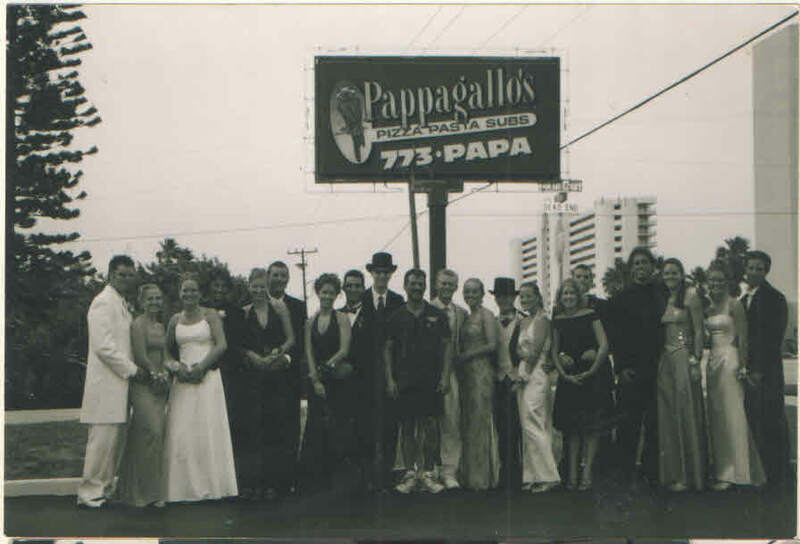 Pappagallo’s Satellite Beach started in 1990, that’s 28 years of watching coworkers go from casual acquaintances to being part of a family. If you’re reading this I have no way of knowing where you work or the amount of hours you put in a week. My hope is that you work in a place that allows you to experience what I’m going to try to explain to you here. The situation starts pretty much the same way: A new hire comes in and may know 1 or 2 people who may have told them this is a cool place to work, or maybe they just walked in on their own. Either way they interview and come in for a few hours to hang out and see what they think of Pappagallo’s Satellite Beach and to get a feel for the people they will be working with. We’ve only started doing it this way over the last few months. People come in and they have no idea what working in a restaurant involves. Working in a Restaurant Is a lot like the old peace Corp commercials, “it’s the toughest job you’ll ever love,” It isn’t for all that apply. It’s very fast pace some of our guests are less than friendly sometimes (thankfully those are far and few between). If you were looking for somewhere to just sit behind a counter and watch the clock tick by, trust me the food industry isn’t for you. This is the precise reason we invite people to come in and “shadow” someone on staff that’s already does the job they’re looking to get. In fairness when someone comes in, I know what they should expect and what Pappagallo’s Satellite Beach expects of them. This may be their first job so they have no idea what to expect. After years of having people come in only to realize that this work isn’t for them, we decided to take this shadow approach. Let them come in for 2 hours, look around, talk to the staff and see if they want to take a “seat at our table.” At time of this writing we have 40-45 team members. Some are in school, so may only have one or two shifts a week but there are a lot of team members these days. The fun part for me is to watch these people, really from all ages from 16-50, start out as complete strangers but through being here they become closer than some families that I know of.I think that in the heat of a rush you either have to work together or the whole team falls apart, that’s an unwritten policy around here. It’s unwritten on purpose. It’s a way to see who the “keepers” are. If they jump in and help their co-workers then they’ll be here a long time. If they’re from the “it’s not my job” school of teamwork, they won’t be here long. Most of the time the existing team will try to help the step up but if this industry doesn’t suit them, (which doesn’t make them a bad person by the way) we will have a talk and let them find something more suited to their particular skill set. A new Pappagallo’s Satellite Beach team member finds out pretty much right away that we take care of each other. When we’re here and when we’re not as well. I have countless stories of team members helping each other move or one helping the other with fixing their car/motorcycle or countless other times when one of us needed help and we had more volunteers to help than we needed. I’m not sure you get that working for big companies or at some 9-5 office job. Being in the heat of dinner rush at Pappagallo’s Satellite Beach has a way of bonding people. If you work shoulder to shoulder with someone behind the line or out on the floor, after a few weeks you’ll gain a feeling of how they are. You know what part of the job they will handle and what part becomes your responsibility. Servers will ask the cooks if they need a drink if they’re too busy to get out of the kitchen. Expeditors will run food to tables if they see the server is helping another guest. Again these things aren’t trained into any job description it just happens when people work together and develop a relationship that extends past the walls of work. Pappagallo’s Satellite Beach has become much more than a job for me over these years it’s a place that I get to spend years with the generations of young kids from our community. I really get a kick out of watching each new generation of people come through. It’s like a remake of a classic movie. Times change fashion may come and go, but when you take away the fads and the trends going on with any of my “work” kids you will find that young people are young people, that doesn’t change. Thank go. Technology has made a huge difference in how we communicate and in a lot of ways the young people today have an advantage over years past. Back in the 90’s we had to call people to cover shifts, or leave them a handwritten note if we needed to convey a certain message. Now we have text messages and emails. Same idea only delivered almost while you’re still thinking about what to say. What hasn’t changed is that sometimes people still don’t answer texts or didn’t “see” an email just like the old days. Every year the crew at Pappagallo’s Satellite Beach seems younger, they aren’t I’m just older. The personalities remain the same just different actors playing the same role. I take comfort in that fact if you watch the news or read information on the internet (used to be a newspaper) the media will tell you about all the bad in the world and how everyone seems to be evil. There’s more than enough info every time you look at anything on any form of news about how the world is headed down the drain/ I tend to disagree. You see back in the 90’s I watched my crew show up after a fire burned us out of our first space. I didn’t call them they just knew I needed help at a time when I didn’t even know what I needed. I thought I had just lost everything but then my “guys” showed up and just started doing what needed to be done. Almost 30 years later hurricane Irma came to town and knocked our workplace to its knees for almost 10 days. I didn’t make any phone call my new “guys and gals” showed up ready to do whatever needed to be done to get back to work. They wanted to get back to work and missed the food as well as their other family. So I say yeah times change. Technology may make certain tasks easier to do. Yet when the proverbial “chips are down” good people, Pappagallo’s Satellite Beach type people, always are there to get my back. Those aren’t employees values those are family values. I feel very lucky to be a part of Pappagallo’s Satellite Beach for most of my adult life. Honestly don’t know of another job that could give me this level of satisfaction with my life. Thankfully it doesn’t look like I’ll ever have to find another job.